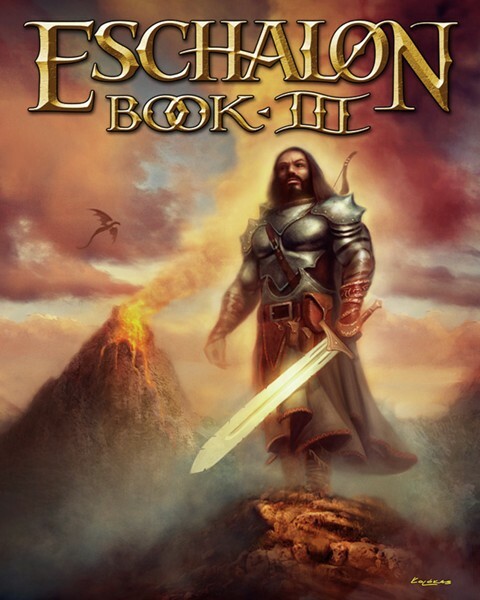 Eschalon: Book III is the finale of Basilisk Games' roleplaying trilogy, following in the footsteps of Book I (released in 2007) and Book II (2010). Book III picks up right where Book II left off, with you being hurtled through space and time into the jungles of Wylderan, where you must once again search for the fabled crux stones so you can thwart the plans of Malkur, aka The One. Because the memory of your character is a little bit finicky -- you wiped it before the start of Book I to hide your intentions from Malkur, and you've had trouble remembering things ever since -- you start over with a new character in Book III, and you can have events from the previous games explained to you if need be, which means you can play Book III even if you've never touched Books I or II. When you begin a game of Eschalon: Book III, you have to create a new character, and this requires you to make some decisions. You have to choose a gender (where males get +1 strength and females get +1 dexterity), an origin (which gives you +3 to your attributes, depending on where you decide to be from), an axiom (a world belief that gives you a bonus and a penalty, or no change at all if you choose agnostic), and a class (fighter, healer, magick user, ranger or rogue). Your gender, axiom and class combine to give you a title, which in turn gives you a point in one of the game's 26 skills. As an example, if you decide to be a male virtuous fighter, then you become a paladin and receive a point in the swords skill. Each character has eight attributes, where four (including strength and endurance) are tailored more for physical fighters, and four (including intelligence and concentration) are more for spellcasters. When you create your character, you get to roll the starting values for these attributes as many times as you'd like, with the values always falling between 7 and 14. You also receive 20 points to spend freely after you've accepted a roll. Then each time you gain a level, you get three more points to spend. You can also add to your attributes through (rare) bonuses on your equipment, and from (rarer) events in the game. Most attributes give you a concrete bonus every five to ten points -- for example, strength adds +1 to your melee damage every five points, and +1 hit point per level every ten points -- and so you have to plan ahead where you want your points to go. The attribute bonuses aren't retroactive, so most people will probably put points into endurance (for more hit points) or perception (for more mana) early in the game. Characters also have access to 26 skills: seven weapon skills (including swords and bows), three armor skills (including heavy armor and shields), two magic skills (divination and elemental), five rogue skills (including pick locks and move silently), and nine utility skills (including cartography and repair). This is a nice mix of skills, and they give you plenty of options for how to spend the 15 skill points you receive during character creation, plus the three you receive each time you gain a level. Skills have diminishing returns, and they're all useful in their own way, so characters are more powerful when you spread your points around rather than dumping them all into one place. To help you out in your skills, you can meet some trainers in the game, who can teach you ranks of a skill (up to rank 8) for a cost -- and usually only if they like you and you do something for them first. You can also find skills books, and use them once for each skill. Along with the skills, characters can learn up to 47 spells in the game, including Spark, which zaps enemies with electricity, Cat's Eyes, which lets you see better in the dark, and Portal, which allows you to move around the world more quickly. All classes of characters can learn spells, with the number and quality of them depending on the character's attributes and magic skills. So a full-fledged magick-user will be able to cast a lot of powerful spells and regenerate mana points quickly, but even a fighter should be able to pick up some healing and buff spells to make life easier. Characters can reach somewhere around level 20 in the game, which nicely isn't enough time for them to become a master of everything, even if you plan ahead so they visit trainers as much as possible. I played an unarmed specialist in Book III, mostly because I hadn't tried one yet in the trilogy, and also because Basilisk Games added unarmed weapons (think brass knuckles) to the equipment you can find. Unarmed characters have the best weapon feat in the game (characters gain access to special weapon attacks -- called feats -- when they reach rank 10 in a weapon skill), and I pretty much cruised through the campaign with my pugilist. But whether that's because unarmed characters are powerful, or the game is easy, or I just know the engine too well at this point, it's tough to say. Finally, before starting the game, you also have to toggle some rules on or off, where the more rules you leave on the tougher the game is, but the better equipment you find, and the more experience points you earn. There are four rules in total: characters need to eat and drink, equipment needs to be repaired, item drops are fixed rather than random, and saves can only be performed when no enemies are around and your character is healthy. Since I was doing prep work for our (soon to be) walkthrough while I was playing, I only had the first two rules on. The rules allow you to tune the game so you can enjoy it more, but they're not really difficulty settings. There isn't any way to make enemies smarter or tougher.